On hand for Thursday's cheque presentation at UBC Okanagan were, from left, Dr. Joan Bassett-Smith, Director of the School of Nursing; Donna Kurtz, Assoc. Professor of Nursing; Kelowna-Lake Country MLA Al Horning; Dr. Carol McFadyen, Assoc. Director of the School of Nursing; and Dr. Joan Bottorff, Dean of the Faculty of Health and Social Development. 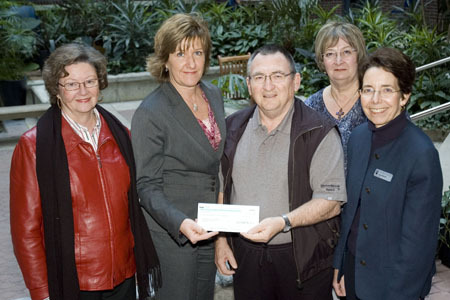 On Dec. 6, 2007, the University of British Columbia Okanagan received $34,055 as part of the B.C. Government’s Aboriginal Nursing Strategies, a provincial initiative that has provided $500,000 in 2007/2008 to increase the number of Aboriginal communities with quality nursing care and to increase the number of Aboriginal nurses working in B.C. communities, Kelowna-Lake Country MLA Al Horning announced today.